Confidence isn’t about other people. Confidence is really about the stories we tell ourselves in our heads. It’s revealed in our body language, our word choices and the image we project. In general, we find confidence an appealing, attractive trait in others, which means that if we can boost our own confidence, the image we convey is perceived as stronger, more dependable and more charismatic. 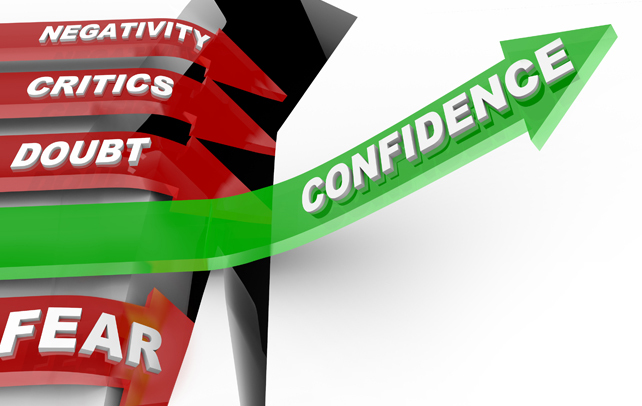 How can you boost your confidence? 1. Get your body on board. The next time that you’re sad about something, try to smile convincingly. You’ll find that it’s very difficult, and that’s because there’s a connection between our bodies and our minds. If you want to project confidence, then change what your body’s doing. Stand or sit up straight, put your shoulders back, put your chest out, and you are getting both your body and your mind into a more confident state. When you know you have a difficult call or conversation, get yourself physically prepared. 2. Pump yourself up. We all talk to ourselves, even if it’s an internal monologue. Change those words that are negative. Choose a powerful mantra for yourself, and repeat it until you believe it (so that you can make it true). Tell yourself, “I am the best accountant, and I am going to show the world.” Focusing on the process of showing the world that you are successful and valuable lets you create a narrative—a story—that doesn’t have to be complete to be useful. You don’t have to be acknowledged as the best in your field … yet. You just have to be working on it. 3. Exercise. It’s absolutely critical that you get regular exercise. Study after study has proven that exercise boosts creativity, focus, stamina and productivity—all of which makes you better in your chosen field. An often overlooked benefit of exercise, though, is its profound effect on your confidence. Knowing that you’re taking care of your body will help you stand up straighter and feel better able to handle business challenges. 4. Sleep. Like exercise, sleep is mission critical. Sufficient sleep is an essential component of health, so I often wonder why so many people boast about surviving on very little sleep. The tendency to emphasize how busy (and important) we are by claiming that we simply don’t have time to get enough sleep is doing us a great disservice. If we get the sleep we need, we’re sharper, more efficient and much more confident. Sleep gives us the energy and the willpower we need to achieve our goals. 5. Hang out with confident people. There’s a saying that resonates with me: You are your five closest friends. Choosing confident people for your inner circle will help you create and maintain a confident demeanor in your business dealings. Now remember: Confidence and arrogance aren’t at all the same thing. I’m not suggesting you surround yourself with a bunch of blowhard windbags. Pick people who are genuinely (which sometimes means quietly) confident. 6. Be humble. Humble is not the opposite of confident. Humility is the recognition that we’re human, and therefore fallible. Confidence is what brings us through our failures, mistakes and difficulties to emerge as successful people. Humility is what helps prevent our egos from getting in the way of our success. 7. Live your passion. When you’re deriving joy and energy from your work, rather than letting work consume your soul, increased confidence will naturally follow. When your work becomes something more than an obligation, you’re on your way to becoming more confident. 8. Exercise your confidence. Confidence is like a muscle. If you build it and push it, it will fail from time to time, but it will also heal and grow stronger than it was before. Pushing yourself to let your confidence carry you past your comfort zone can be the key to achieving great things … with even greater things in the future. Confidence comes with achievement, for sure, but it can also come from the certainty that you’re on the path to success—even if you haven’t yet achieved that success. Confidence doesn’t mean that you never have doubts, but it does mean that you believe in yourself, and your vision, enough to keep moving forward and working toward your goals. One last thing that I love about confidence: It’s self-perpetuating. If you believe, then you’re more likely to succeed, and that success, in turn, gives you confidence! ← Nigeria, What Else Do You Want from God? Are You Aiming For The Sky?… Personal Development Is key!